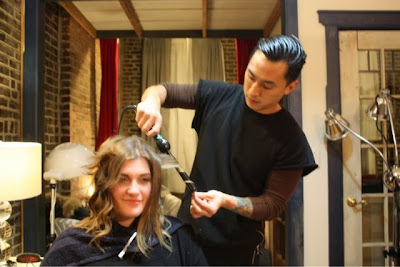 A while ago I got to meet the talented master hair stylist, Ray Guh. When he asked me to swing by his new studio to sit for him as a model how could I say no? First, some background. I don't get my hair done very often. I probably hadn't gotten it touched in over a year. 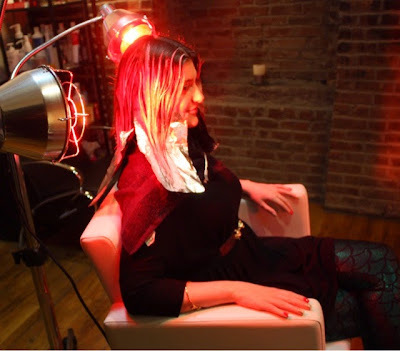 I've never had it professionally dyed and I was ready for a change! I have always been obsessed with a long A-line cut after I saw the terrible movie Doomsday featuring Rhona Mitra. In the movie she sports a very high in back, long in front, wavy A-line. I gave Ray a little idea of what I was looking for and he went to work! First went the length. I haven't had medium length hair since I was a kid! After a quick cut, Ray went to work hand painting individual sections of my hair for a soft balayage to add some dimension to my hair. 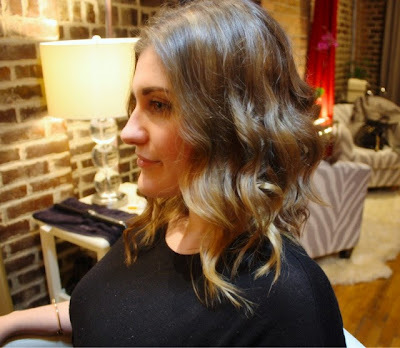 I also know I'm not into getting my hair done all that frequently so a coloring that was natural on top and becomes lighter on the bottom is a great option for me as it grows out. Ray's private studio has everything! It's set up intimately to take one customer at a time and has absolutely everything that a larger salon would have. 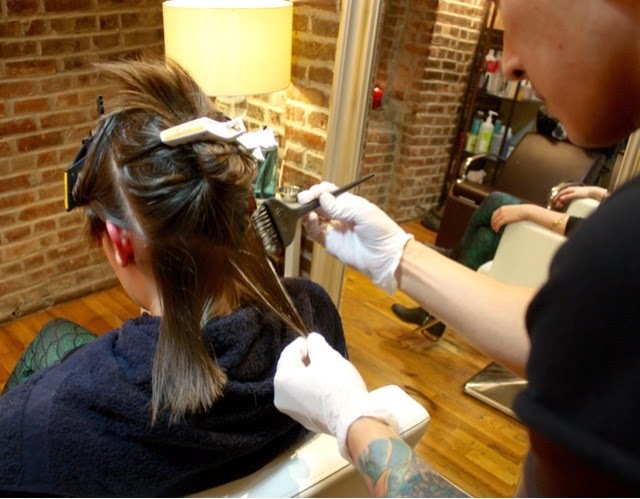 Ray told me he wanted 100% off his attention to be on each customer when they're with him, as opposed to the hustle and bustle of a busy salon working on getting out out of the chair as quickly as possible. The studio is lovingly decorated. There is a funky metallic deer skull hanging from one wall and some zebra striped lounge chairs if you bring a posse. 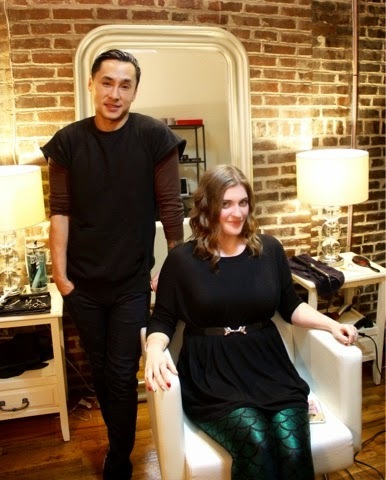 What's a cut and dye without a style! I first met Ray when he was styling hair for an event and he does gorgeous work! I'm planning to wear this A-line cut with loose waves. The final look is exactly what I wanted! I've got a soft fade to lighter ends, but nothing noticeably fake or artificial. 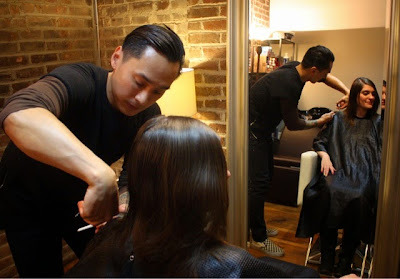 The cut is long in the front and a bit shorter in back. The waves look so good! This length gives my hair a lot more volume. Are you in NYC? Stop by Hair Craft Studio by Ray at 167 W 21st St. He's even running a pretty amazing voucher of $150 to his studio when you pay $100. What do you think of my new do? Being at New York Fashion Week for the Winter/Fall 2015 season went by in a flash! 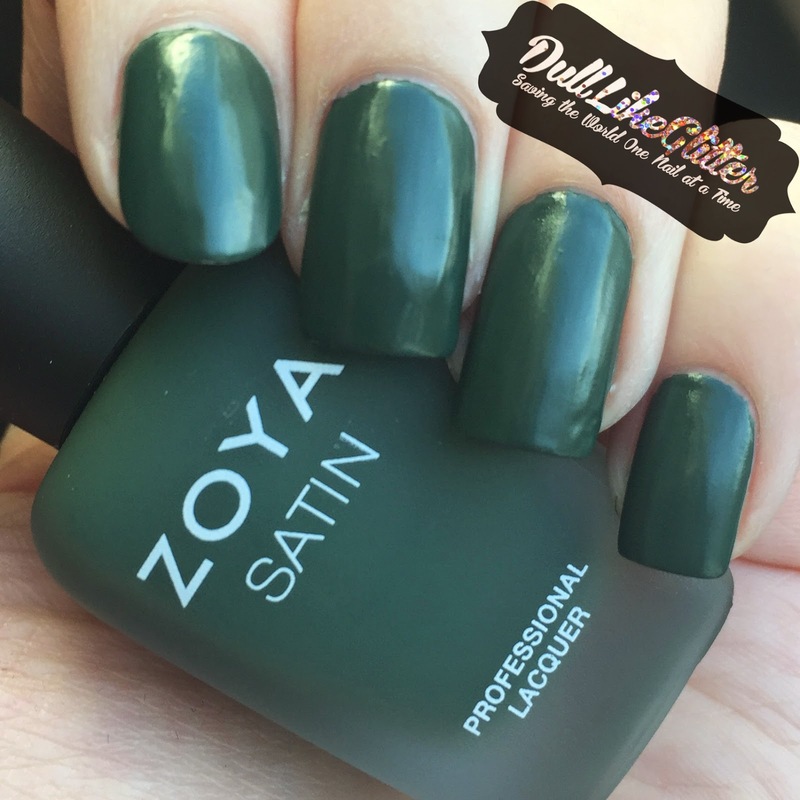 Zoya was kind enough to have me backstage at a few shows to catch the nails for the runway. The Rolando Santana show was unique in their shades. 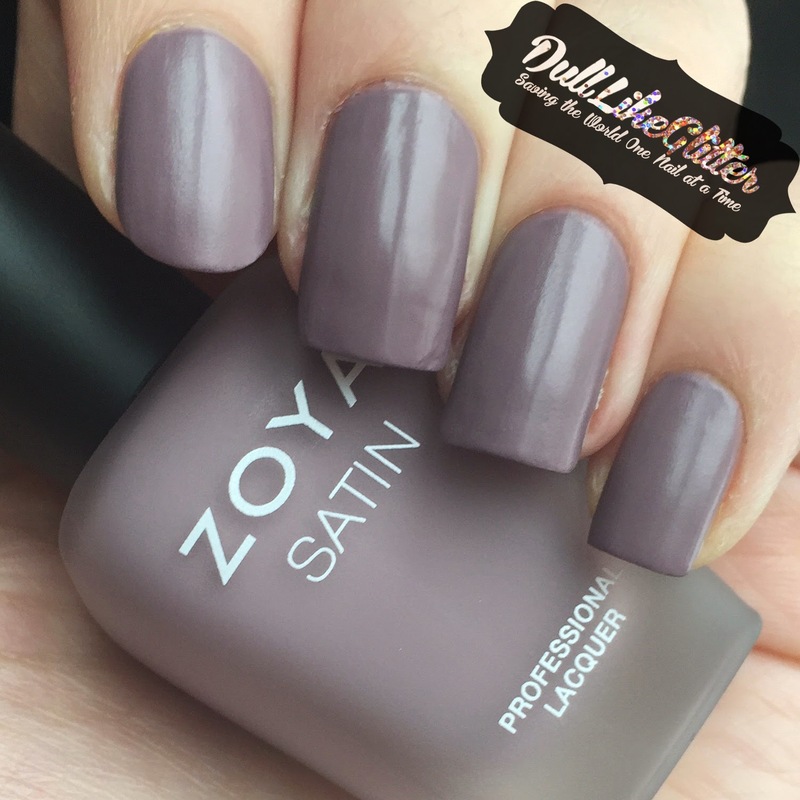 Zoya custom mixed three satin shades just for the show! Satins were all the rage at Fashion Week this season. Essie, Zoya, Julep, and many other polish brands are debuting these mixed finish shades that give a soft focus effect somewhere between matte and glossy. Constance is a forestry, moss green. I love that the satin finish adds to the earthy feel of this polish. Dagmara is a soft, puce shade. This is very complementary to my skin tone! This may be my favorite from the trio. Antoinette is a stunning, muted navy. I love the shade, but the formula was a bit thick. All of these satin shades had fantastic coverage and could have been one coaters, but I used two just for good measure. 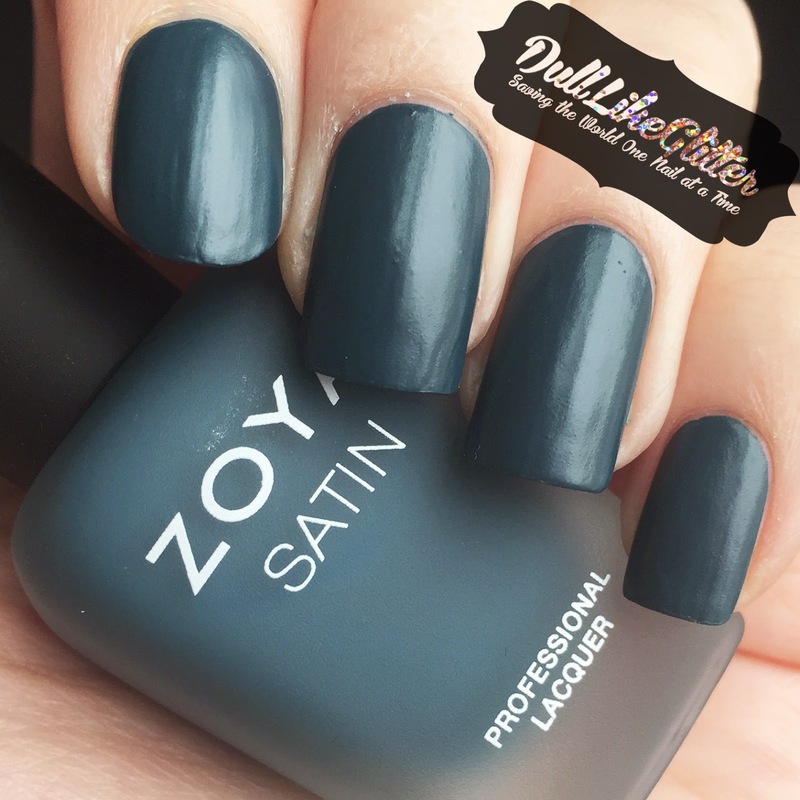 Since you are going to be seeing a lot of satins hitting the shelves for spring, you may be wondering how different they actually are compared to glossy and matte finishes. Here we have Constance with a glossy to coat on the pointer, a matte topper on the middle, and satin finish on the ring finger. Which finish is your favorite? 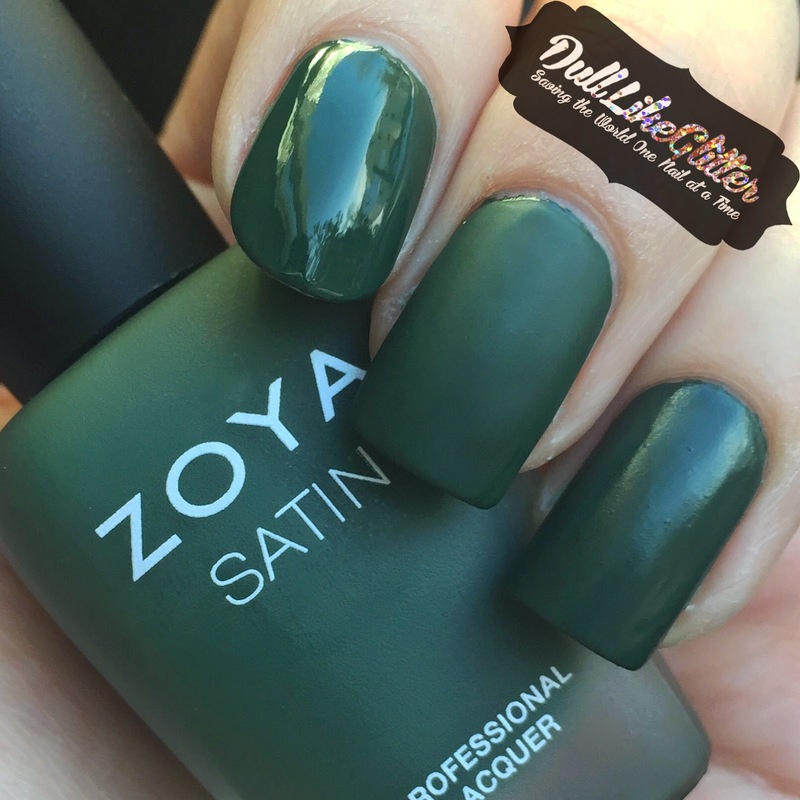 Are you excited to try satins on your nails? Fashion Week has been an insane whirlwind this season! The looks for Winter/Fall 2015 are strutting the runway. Many of the repeating trends have been high necklines, embellishments and gems on garments, naturally worn hair, fur combined with leather, and dress pockets. That's no fun when it comes to nails though so I searched out some of the most colorful, brightest looks on the runway. Of course, Jeremy Scott came to mind. 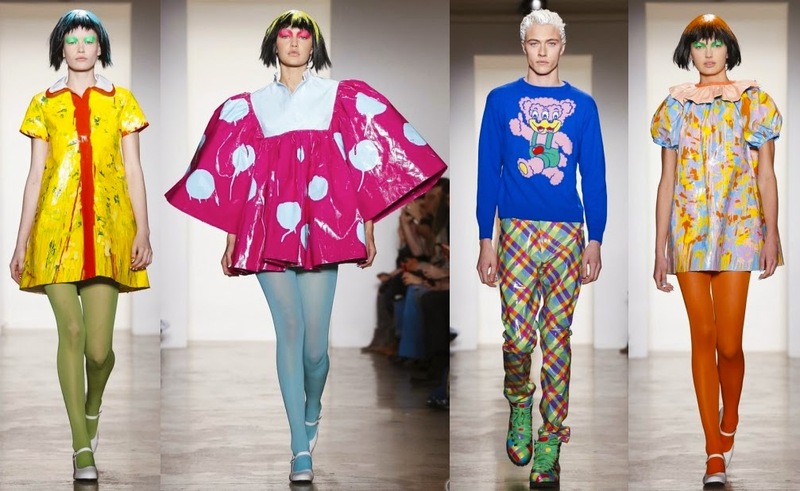 Jeremy Scott's W/F season is full of color, prints, and exciting patterns. I used inspiration from four of his runway looks to create some corresponding nail art using all China Glaze shades and some acrylic hand painted accents. 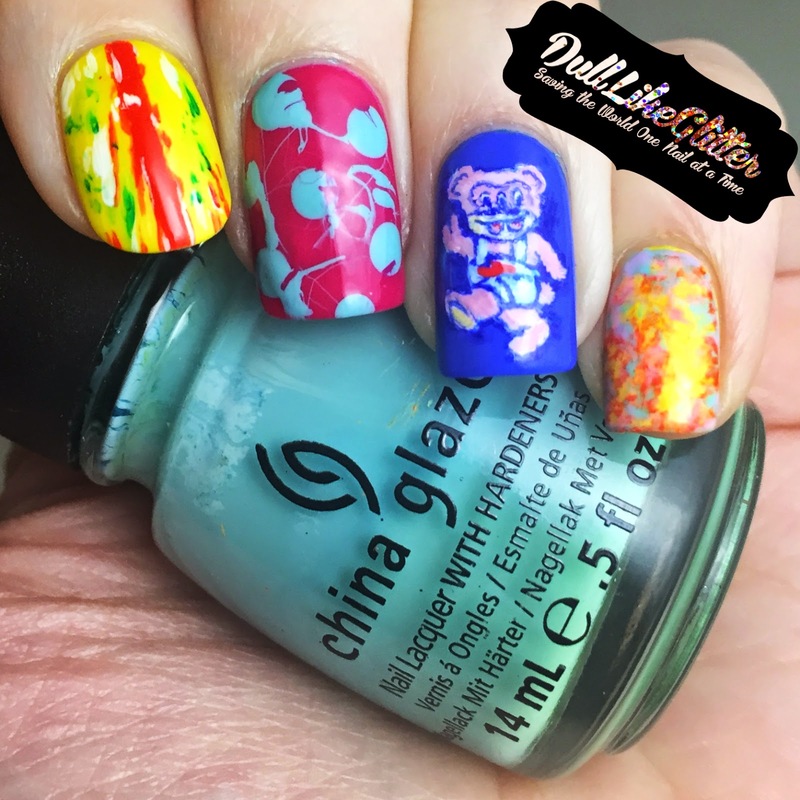 I used Sunshine Pop as the base for the first nail and hand painted all the other splatters of color. For the middle finger I used a base of Fuchsia Fanatic with messy polka dots of For Audrey. The ring finger has a base of Man Hunt with a hand painted three eyed bear. Finally the pinky finger is a saran wrap nail using Sunshine Pop, For Audrey, Life Saver, and Something Sweet. 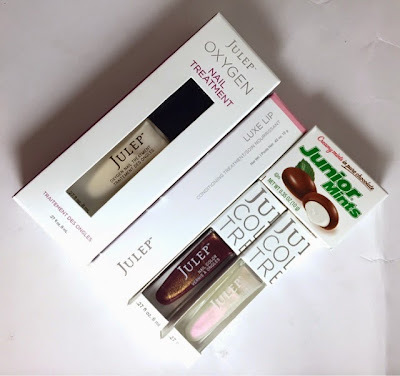 It's been awhile since I've blogged about my Julep Maven boxes! I've still been getting them monthly, I just haven't had much time to sit down and write about them. This year I want to keep up with my subscription boxes. Any bets on how long I'll last? If you comment and are correct I may send you a prize box! This month features The Chrysalis Collection. This box came with a free metamorphosis top coat, playing into the collection namesake. I switched over from my regular Bombshell box to Classic with a Twist. With the extra free gift, my box is packed full this month! 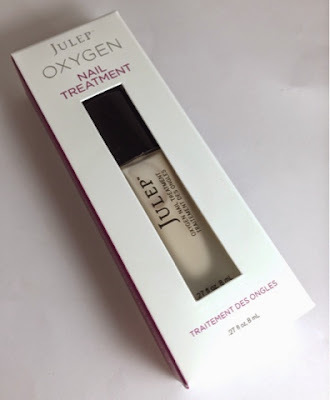 My products this month included a Julep Oxygen Nail Treatment in Ivory, a Luxe Lip in Sheer Pink, Julep Maryam, Julep Tyra, and some Junior Mints! 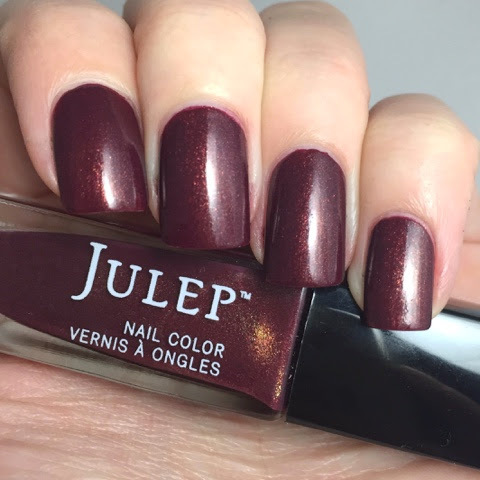 Maryam is a merlot shimmer while Julep Tyra is a very sheer, purple pearlescent topper. 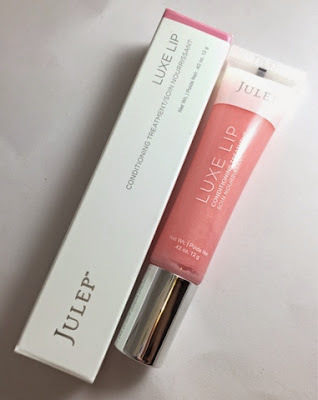 Julep's Luxe Lip is enriched with natural ingredients to soothe, hydrate, and plump. Sheer Pink has a shimmery tint that still lets my lips look natural. 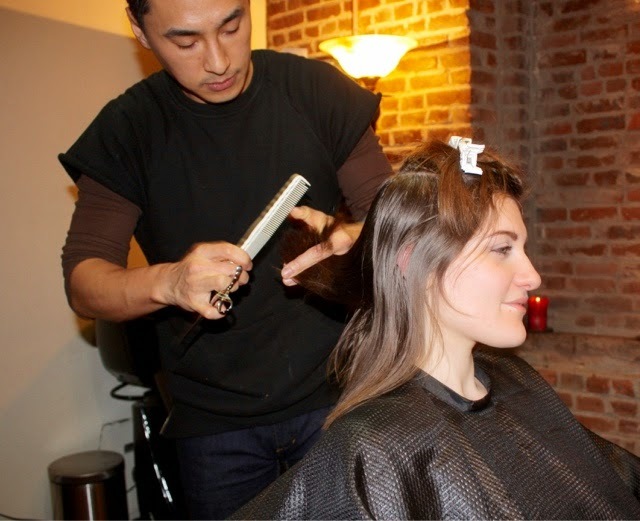 I love the cool metal tip of the applicator! It gives me a nice smooth application and is really refreshing. Julep's Oxygen Nail Treatment is a favorite of mine. I'm always wearing it when I'm giving my nails a day off to allow them to breath and strengthen. I loved that they released this in a new ivory shade and I had to have it. I'm happy to add it to my collection! Tyra is shown here alone on my pointer and over various colors. 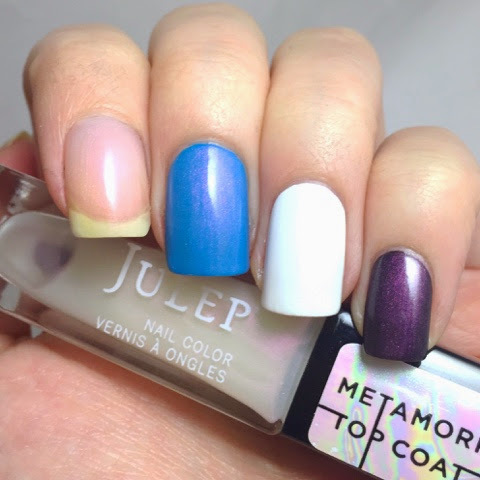 The Metamorphic Top Coat collection can be used over different colors to change their finish. The color really shows up best over dark shades like black or navy. I can see using this over Zoya Casey (an almost black, vampy purple) to give the shade more dimension and pop! Maryam is a very pretty merlot full of golden shimmer. 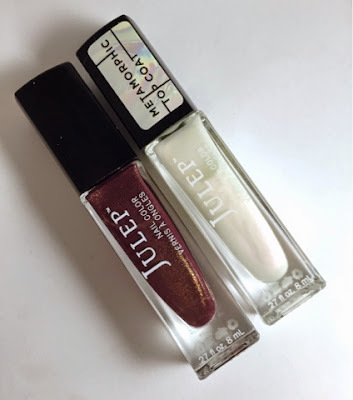 If there is one thing Julep does well, it's shimmer polishes! This shade perfectly captures gold at the right angles when your nails hit the light. Want to try Julep out yourself? This month they're running a special! Sign up by clicking here and using the code BEMINE. You'll get a free 4-piece intro box worth $58 including a holographic heart glitter top coat, plus three more beauty treats. You can keep the freebie box and cancel your subscription at any time. Template Created by Girliest Geek. Powered by Blogger.